This is the second time we have made lard. The first time was in a lard making group party where no one had done it before. We spent the whole time reading out directions and asking each other if they thought we were doing it right. Thankfully, this time it seemed much easier after doing it once before. We requested that the fat be saved from the half of pig we bought when it was butchered. 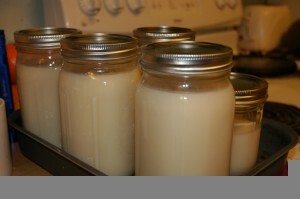 Our lard from last year was getting down and we wanted a fresh supply for next year. Some things taste best cooked in lard. The goal in rendering lard is to boil out all the water and strain out all the impurities. You do this by slowly melting the fat, and raising it to a temperature just above the boiling point of water. If you get it too hot, the oil will start to burn and the lard will take on a “piggy” taste. This is not a fast process. I know some people toss it in a large casserole dish in the oven at 250 for 24 hours or so. We processed it in a pot on the stove top for about 7 hours. The fat will come from the butcher in what looks like ribbons. That surprised me for some reason. I’m not sure why. I ground it up as it seems to speed up the whole melting/cooking process. I used my grandmother’s old sausage grinder that my mom lent me. You add a little water to the bottom of the pan. This is to help conduct heat to the pieces of fat which starts the melting process and helps prevent burning. About a half cup of water or so will do it. We started out with just a little of the fat in the pot and then added more as it started to melt. To help speed along the process, we started straining out the bigger bits left in the oil. It was getting very late at this point and most of the fat had melted. When all the water is boiled out of the oil you won’t get bubbles raising through the liquid. You want to make sure that all the water gets boiled out, otherwise you can get botulism in the lard later on. Here is what the some of that strained material looked like. We used canning jars for containers. We put the jars into a pan that was on top of some hot pads. The oil is VERY hot so you need to be super careful. 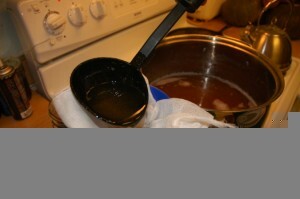 Once the water is boiled out of the oil, you place some cheese cloth over top of the jars and ladle oil into them. This will strain out all the fine particulates left in the oil. The hot liquid oil will be yellow in color. Don’t worry, that’s normal. Wipe off the rims, put the lids on, and then screw the rings on. 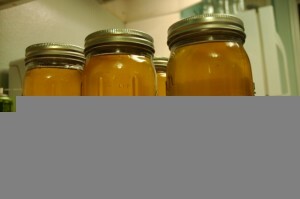 You wouldn’t think it, but that yellow stuff you put into the jars turns into a nice cream color once it solidifies. We ended up getting a little over 4 quarts from that half of pig we bought. This entry was posted in Skillset. Bookmark the permalink. Very interesting! What do you cook in lard? It makes the best fried eggs! I also use it when I make pie crusts. It tastes awesome! Biscuits become better too. When I have left over cooked potatoes I fry them up in it. I’ve heard that it makes great refried beans though I’ve never tried it. Same with tamales, tortillas, and other things. Since I don’t have a oven to cook in at the moment I haven’t got to use it as much as I would like. I stopped using crisco before we moved up to Oregon so it just adds another more natural oil to my cooking options. Good for you for making lard! Definitely an added value to your purchase. Now that I’ve been reading Nourishing Traditions, I’ve been looking for good fats. That’s one of the reasons I hope we can someday get a pig. For that and the sausage! Leigh – Really late reply I know, but I just noticed your comment. My interest in lard was first raised by reading Real Food by Nina Planck. She quotes liberally from Nutrition and Physical Degeneration by Weston Price, which is of course the source material for much of Nourishing Traditions as well. Amy – Thanks for the comments. We’ve never had any trouble with condensation, but we screw the lids on right away and let the boiling oil heat help seal the lids. Regarding the texture, the lard has fortunately rendered out smooth for us. We did notice last summer when the heat got around 100 outside that the lard in jars in our cupboard melted and when it solidified it took on a grainy texture thereafter. I wonder what’s going on to cause that, and why beef and pork fat might be different. Do you use beef fat in cooking similarly to lard? I never thought of using a crockpot. (We don’t have one, either, though.) I know that when we get an oven working in the house again, that I hope to process the next batch in that. I’ve read that you can just put all the fat in a couple large casserole dishes, set the oven to a low heat, and leave it for hours. Seems like less work than stirring and screening out of a pot. I make abour 20 Gallons of lard yearly. 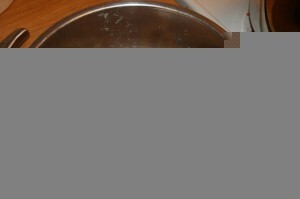 Its great for deep frying turkeys and frying fish you cant beat the taste. Plus it saves me money on my turkey frying business by replacing that expensive peanut oil. We haven’t tried deep frying with it yet, but it sounds good. We’ll have a pig and a half’s worth of lard to render in another month, so that will be a pretty big stock for us. We’ll be butchering our pigs late next week, so I’ll be referring back to this post when it’s time to make the lard! I’m very excited to give it a try. Do you know how long the lard lasts on the shelf (unopened)? And, do you refrigerate it once its open? According to my understanding, if you boil 100% of the water and solids out, then nothing can grow in the lard (bacteria / fungus). The fat will still go rancid eventually based on their exposure to heat and light. We keep our lard in a kitchen cupboard, and our kitchen is pretty cool most of the year (40s to 50s in the winter, 70s average in the summer). Our current lard stock is about a year old and we haven’t noticed any difference in quality (other than the graininess, mentioned above, when it melted at one point during the summer). We keep the opened jar on the counter or in a cupboard also, just like olive oil. Lard has a similar fat profile to olive oil, but with more saturated fat (which goes rancid more slowly). I’ve read that when animal fats go rancid, you know. I don’t know if this is true. The fat trimmings from our most recent pigs are still in the freezer, but when we render this next batch of lard I will probably put the finished jars back in the freezer as a little insurance. I hope to go 2 years before we raise pigs again, and I want the lard to last as long as possible. I need to process some more lard as our stock is getting low. I’ve seen fat trimmings for sale around here, but only at the local butcher shops unfortunately. First time making lard, since I just found a place where I can buy fatback. Your directions and suggestions on how to use it were the best of all the ones I read. I am so looking forward to using this and hope to convince people that this truly is better for you than a lot of other fats, but have to make sure they understand the difference between real lard and the awful hydrogenated stuff the stores sell. Thanks again for some awesome information. Thanks! I’m glad our instructions are helpful. It was kind of an intimidating process for us the first time, but after that you have a feel for what the various stages will look like. Supposedly, the simplest method is to just put it in the oven on low heat, but we haven’t had an opportunity to try that. Solid scientific studies have debunked the saturated fat-heart disease link, but I think it will still be years before government policies and nutritionists catch up. As you said, part of the problem is those awful little boxes at the supermarket are also labeled “lard”. Nutrition aside, lard is a hands-down winner in the taste department.